A digital elevation model (DEM) or sometimes referred to as a digital terrain model (DTM) is a quantitative representation of the topography of the Earth (or sometimes other surfaces) in a digital format. They are a common component of geographic information systems /remote sensing and are usually represented by cartesian coordinates and numerical descriptions of altitude. In contrast with topographical vector maps, the information is stored in a raster format. That is, the map will normally divide the area into a rectangular grid of cells or pixels and store the elevation of each one as a DN value. Traditionally most common DEMs used in the Geomatics industry only contain elevation values of the true ground’s surface but DEMs can also sometimes contain other features found upon the ground’s surface as well. When it contains all features it is often referred to as a digital surface (DSM). 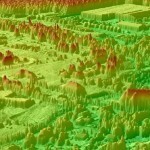 Digital surface models contain elevation values representing the ground as well as any other objects such as buildings and trees. The resolution of the DEM, or the distance between adjacent grid points (often the size of the cell or pixel), is a critical parameter in determining the amount of detail that a user should except to represent in the DEM. The smaller the resolution, the more details or features that will be present, e.g. 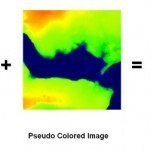 a 1 m resolution DEM will contain more details then a 20 m one and be better suited for hydrological analyses. Digital elevation models may be prepared in a number of ways, but they are frequently obtained by remote sensing rather than direct survey. 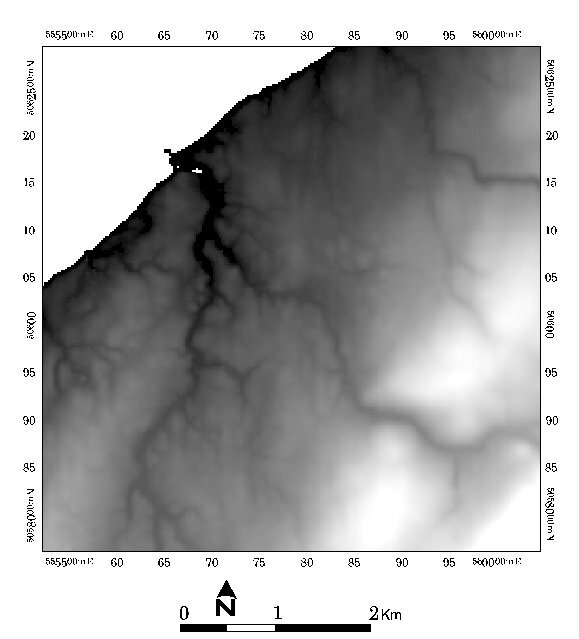 Older methods of generating DEMs often involved interpolating digital contour maps from aerial photography produced by direct survey and interpretation of the surface. Many mapping agencies produce their own DEMs, often of a higher resolution and quality, but frequently these have to be purchased, sometimes at considerable cost. The two methods of creating DEMs that are covered on this web site deal with LIDAR and Photogrammetry methods.